Styling natural hair can be tasking especially if you lack exposure and experience in the variety of styles we can choose from. But not all hope is lost because a new skill can always be acquired and that is when tutorials like the one below come in handy. I was requested to do a tutorial on how to do these needle and thread cornrows several times, quite a while ago. Well, that’s I what I call them because you use a needle, some thread and they look like cornrows. Otherwise, where I was raised, they are called zvetsono, literally translated to “with needle”. 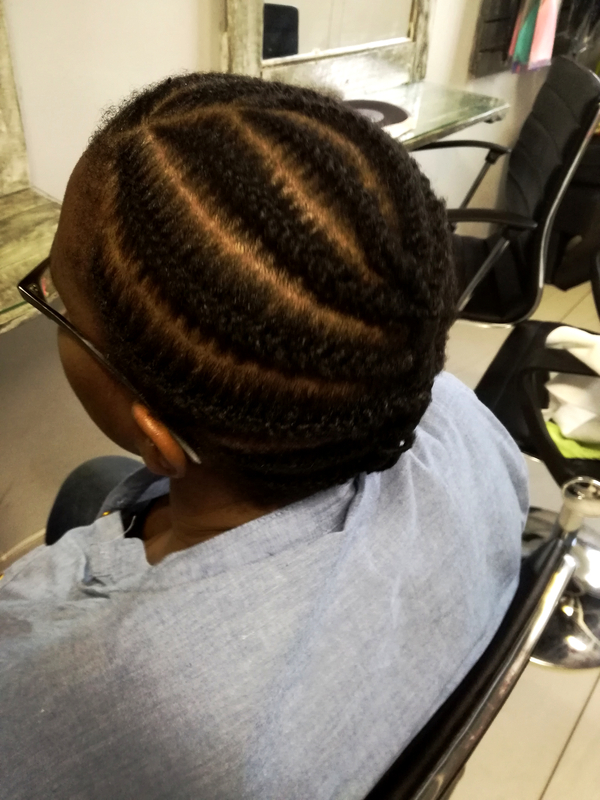 The main advantage of needle and thread cornrows over regular cornrows is that these stay way longer while still looking new and fresh because the thread helps to hold the hair together and prevent fly-aways. I have to caution that you will need to pay particular attention to the tension applied when doing these plaits though because it is easy to get carried away and pull the hair too much. This will only cause traction alopecia so beware. Watch the video to see how I do it to make sure the hair is not pulled too much. Did I mention that this style was done at my natural hair salon, Nashe Hair Studio, where we only deal with natural hair? Yes, we specialise in natural hair care. Treatments, washes and styling are done in a relaxed environment (with no relaxers) with well trained natural hair stylists. We style wet hair and finger detangle before using a detangling brush. We also blow dry on request. Our treatments include going under the steamer for maximum benefit. You should pay us a visit one of these days. Here is hoping that this video is of some value to you and my efforts were not in vain because I did this for you. All information on what I used in the video is in the video description box so make sure to check it out. Please subscribe and thumbs up the video if you like it of course. Thank you so much for coming by and thank you for watching. Will see you int next post. God bless you big time.